As a tech journo and fitness enthusiast I was sure there must be something out there in the electrical goods market that would make protein shake prep time much quicker and easier but wouldn’t be as heavy duty as a kitchen top blender. After very little Google searching I came across a Kickstarter project by a start-up company named PROMiXX which boasted “the world’s most advanced drinks bottle” and it seemed like just the thing I was looking for. I was delighted to recently make contact with the guys at PROMiXX who have now succeeded in their crowd-funding efforts and launched the original vortex mixer as well as a second generation rechargeable model for public sale via its website at www.promixx.com. They were kind enough to send us out a couple of their top of the range mixers to try out and review. So without further ado, this is our rigorous breakdown of the PROMiXX 2.0. The first thing I noticed when taking the PROMiXX 2.0 out of the box was just how stylish and top quality it looks. It’s really the business, especially in the Gold Limited Edition which we were privileged enough to get hold of. It’s also less weighty than I was expecting and this is thanks to the combination of brushed aluminium and lightweight components. I honestly did think that the motor unit might add a bit of excessive weight when handling the plastic bottle but this is not the case at all and if you do still think it might impair your use of it during your workout it can easily be unscrewed and left at home – that is if you don’t intend to blend on the move because obviously you’ll be taking away its power source. The removable base is also a benefit when it comes to recharging as you can unscrew and charge the Lithium-Ion battery independently from the bottle and hook it up to USB lead through computer or compatible USB plug (not supplied). A red LED light will indicate when it’s in charge mode, turning green when the motor is replenished which takes approximately 90 minutes from empty to full. What I did find slightly troublesome however was the tiny rubber seal protecting the battery port – it was a tad fiddly for my barbell calloused man-hands and having a sharp nail (or knowing someone with a sharp nail) is definitely an advantage. Moving on up, from the bottom of the PROMiXX 2.0 bottle stands the mixing blade which is made of a rigid plastic with an interesting shape to offer a good blend for all whey and protein powders. Yes, it’s only plastic but don’t let it fool you into thinking it’s not up to the job because combined with the 16,000 RPM high torque motor it’s just as tough as your workout and whips up a cool looking vortex that can apparently even mix up a mean scrambled egg (which I haven’t yet got around to trying). A 30 second spin will make a good shake but we’d suggest keeping the lid on and the cap closed if mixing in a quiet office as it can be a little noisy – as my startled colleagues can attest! The bottle also comes with handy measuring scale up the side which is displayed in 50 and 100 millilitre increments and I tested the PROMiXX 2.0 with several brands of powder including Protein Dynamix, Time 4 Nutrition and Optimum Nutrition and the mix was top notch for each – regardless of whether the powders were thick and heavy or dust-thin. In the off-chance that your shake starts to settle you can give the X button a quick blast and let the mixer blade deal with it coolly and discretely even when at the gym, without the lunatic shaking action usually employed. To confirm the theory that “the proof is in the pudding” I was even able to mix up some PD protein mousse to perfection, which, by the previous mixing-by-hand method, always left the finished product a bit unsatisfactory and far too lumpy. To sip your supps the PROMiXX 2.0 features a plastic flip cap which has a rubber seal to lock it securely and keeps all your contents inside the bottle when in your bag or during an activity. To me personally, this is really important as so many shakers I’ve used have at some point resulted in product seeping down the bottle after a good shaking or ending up places it shouldn’t be (like the seats of my car) so this is a simple but well thought of addition. The lid screws off to reveal the Nutripod which is a removable compartment large enough to handle a scoop or two of your favourite product and adds to the overall completeness of the PROMiXX 2.0 as your on-the-go protein solution – the perfect blend of traditional shaker features and innovative tech. 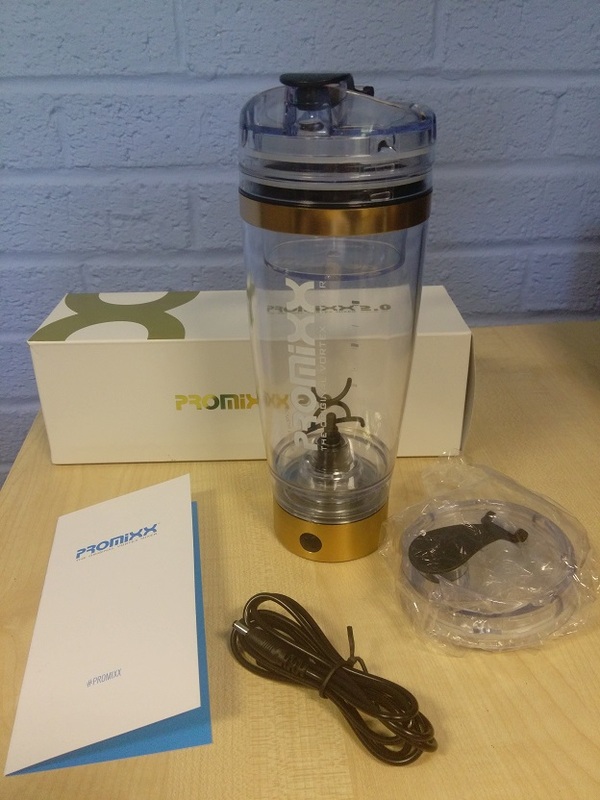 The Gadget Helpline is very impressed with the PROMiXX 2.0 as are many of the sports industries leading athletes. It’s a functional and complete product and it draws some looks in the gym for all the right reasons. The Gold Limited Editon which we tested is available now at www.promixx.com costing £44.99 with the same model also for sale in only-slightly-less majestic colours of Black, Silver and Blue for £39.99. If this is still all a bit too fancy for you or you want to start with a more affordable alternative, the original range of battery powered vortex mixers is still in the store for just £18.99 with an upgrade pack available for £16.99 which brings it up to similar mixing capability as the PROMiXX 2.0. Big thanks to PROMiXX for the opportunity to review the PROMiXX 2.0.